Fruit smoothies are a fun way of having different types of fruits for breakfast. Depending on the season you can create delicious combinations of breakfast smoothies. They are also great for taking on-the-go if you are in a hurry and don’t have time to actually eat the different fruits. But just as you need to chew the fruits and take every other bite after some time, do the same with smoothies, instead of gulping them down, drink them slowly, savouring each sip. Add some nuts, dried fruit, and/or seeds to add to the nutrition. 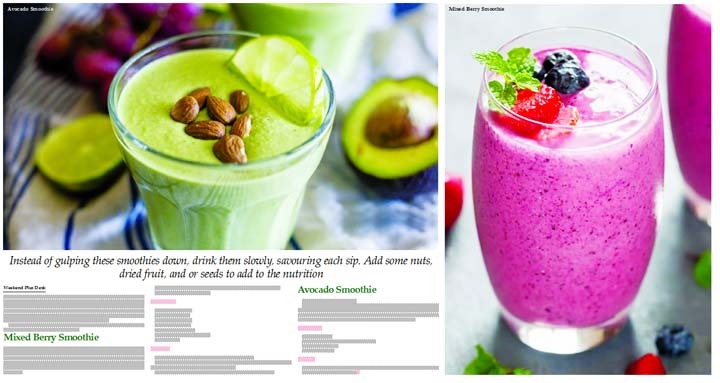 Below are two of my favourite morning smoothie recipes. The good thing about berries is that when in season, they are there in so many different varieties. Berries are also one of the most easily frozen fruits. Just wash, dry, and pop into the freezer. I often freeze berries in individual smoothie packs and then in the morning, all I have to do is throw them along with some water and blend. Berries are also great when combined with other fruits like melon and berry smoothie. Instead of water, you can also add some fresh orange juice to the recipe. * Wash all the berries under running water in a colander. * Trim the top of strawberries and then put all the ingredients in a blender. You may reserve a couple of mint leaves for garnish. * Blend until smooth and thick. Top with some fresh mint and serve. The avocado for this smoothie should be very ripe. Enough that you can make guacamole with it. Slightly more is also good. Use this smoothie recipe to make any single fruit smoothie with milk and/or yogurt. Alkaline fruits like avocado, banana, mango, chikoo, etc are ideal to make smoothies with milk products. * Scoop out the avocado pulp directly into the mixer jar. Add in milk and honey.